The SSL 1235 is an incredibly useful combination of an ADSR Envelope Generator (ADSR) and a Voltage Controlled Amplifier (VCA). Arguably one of the most convenient and space efficient pairings of functions, this new single width module would traditionally require at least two separate 1 MU modules. The compact design with lower cabinet space has many price / space / performance advantages over other available modules. The ADSR is a completely modern, microprocessor based design, and the VCA has a high quality signal path and linear control response. 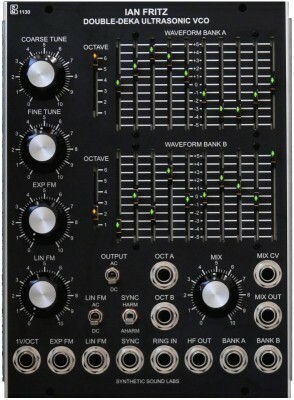 The ADSR and VCA have been ‘normalized’ for convenience, but may be used completely separately. The VCA has a high quality, DC Coupled signal path and linear control response with controls for initial level and external control voltage amount. The ADSR is a completely modern, microprocessor based design, capable of functions virually impossible to create in the strictly analog realm. A Mode switch selects between Normal (single gate input per cycle), LFO (continuous cycling), and Gated LFO (cycles while Gate is applied). Also included is a switch to select between the ‘traditional’ Logarithmic envelope shape, a Linear envelope typical of early-era digital synths, and an Exponential envelope that’s handy for using linear VCAs is if they had an expo mode. Very snappy. A manual Gate button is provided which contains an LED indicating the relative output levels. Fast Times – The Minimoog, Sequential Pro-One and SH101 all have famously quick attack times of around 1 mSec. These snappy times are duplicated by the 1235. Long Times – Most analog synths can do a slow attacks or decays/releases of a handful of seconds, but the 1235’s 10 second times gives a nice range of 1 mSec to 10 Secs (1:10,000), and allows very slowly evolving sounds to be generated. The 1235 achieves accuracy and precision due to its internal microprocessor based architecture. It provides 8-bit internal envelope mapping and calculations, but the final LEVEL_CV multiplication provides effective 16-bit calculations, of which 10 bits are ultimately output. - Lighted slide controls. Brighten to highlight stages. - Synthesizers.com 6 pin Molex standard. Width - One Moog Units (MU) - 2.125"